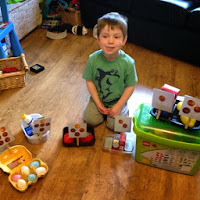 T loves playing shops, the problem is that we don't have a till and he always wants to be the shop keeper with the till. He's not going to have a till (unless one is donated or found very cheap second hand!) he doesn't need one and needs to understand that he is not going to have every single toy he sees. For this activity T asked if we could go and buy a till! I said no but that we could use his coins and that I'd make him some price labels, he was happy with this! I set out by taking photos of some of his coins and re-sized them to make 3 x 3 inch cards, on the back I added the corresponding number, then laminated. Using washi, I attached the labels to wooden pegs and we clipped them onto our play food baskets. On this occasion I didn't get our Market stall out, I just brought down some display baskets, that we use - well actually they are the containers that fruit and veg come in at the supermarket! T asked if he could be shopkeeper, I then shopped! I asked for items he had laid out and asked him how many coins I needed to buy it! He counted the coins on the labels to do this and I counted the coins over to him. I'm hoping we'll be able to extend this eventually by him reading the number on the back of the label. 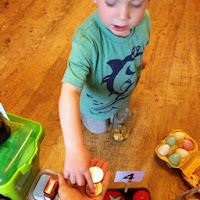 We then swapped places and I asked T to count the coins over to me when he made his 'purchases'. 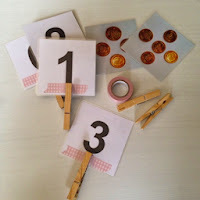 We went on to do some basic addition, I set out the coins needed to buy 2 items and T counted them all together, also as shop keepers we counted up our 'takings'. I'm looking forward to developing new ways of playing with T as he gets older and introducing a little basic learning along the way. I think T enjoyed this activity just as much as he would have had using a plastic bleeping till, he really enjoyed the interaction we had whilst playing. 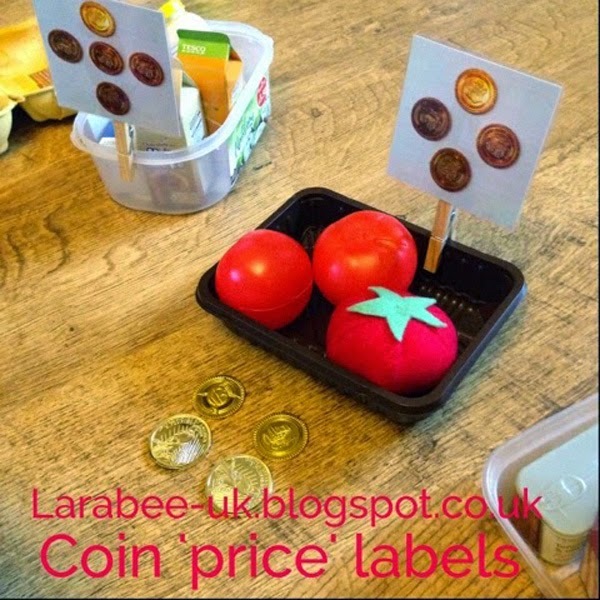 You can print your own copy of our coin labels here if you like. Usual disclaimer applies, this is a really basic, thrown together printable, but if you are looking for something really quick to print and use on a rainy afternoon, it should fit the bill! What did you use to stick the coin onto the card? This is a great idea... I love DIY toys rather than spending lots on toys! 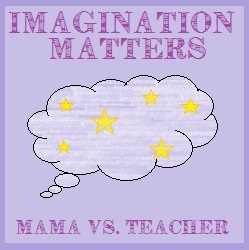 Thanks for linking up to #imaginationmatters again, I'd love to see if you have something for the "emergency services" week!